A while ago I wrote about my most frightening workplace experience in a post called “Emotional Aftershocks“, which included a section titled “Zero Tolerance is Unrealistic and Unfair”. What’s Wrong with Zero Tolerance? It is inevitable that health services, hospitals especially, will have a large percentage of patients who have cognitive and perceptual deficits due to the very medical condition that has them bought them to the health facility in the first place. About 9% of the over-65s (a significant component of health service users) have dementia. Often these people will not have the cognitive capacity to discriminate between friend and foe, and will, at times, lash out to defend themselves against a perceived threat. All the shouty “Zero Tolerance” signs in the world will not make a difference to this. Why would we want to create a false expectation for staff? Huh? Of course people will get angry: it is an unavoidable, natural human emotion. 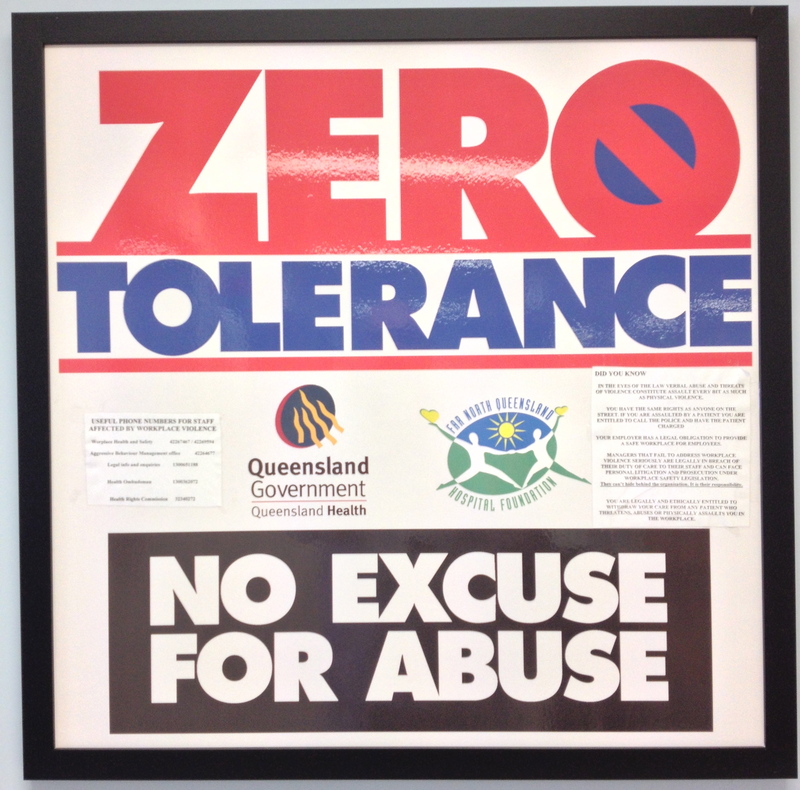 The “zero tolerance” concept is unfair because it is not reciprocated. We (that’s “we” as in “we the health system”) require patients and their loved-ones to be incredibly tolerant of us. Think waiting lists, physical discomfort, unplanned delays, unclear communication, unmet expectations, cancelled procedures, lack of privacy, lack of dignity, lack of control, lack of compassion, lack of progress… the list could go on. Can you find me a health facility where no patient has ever experienced these things? Our health system relies on people being tolerant. This “zero tolerance” malarkey doesn’t allow for the reality that people in hospital are often having the most traumatic, frightening and disempowering day(s) of their life. It would be lovely for staff if everyone experiencing acute emotional distress expressed their emotions in a clear, calm and composed manner, but is it realistic? We need a smarter, more sophisticated way to manage difficult emotions in the health care setting. “Zero Tolerance” is jarringly out of step with the nurturing, caring, compassionate, altruistic qualities that most health professionals identified with when choosing their career. We need a new set of posters that are attuned to the needs of patients and the aspirations of health services and clinicians. 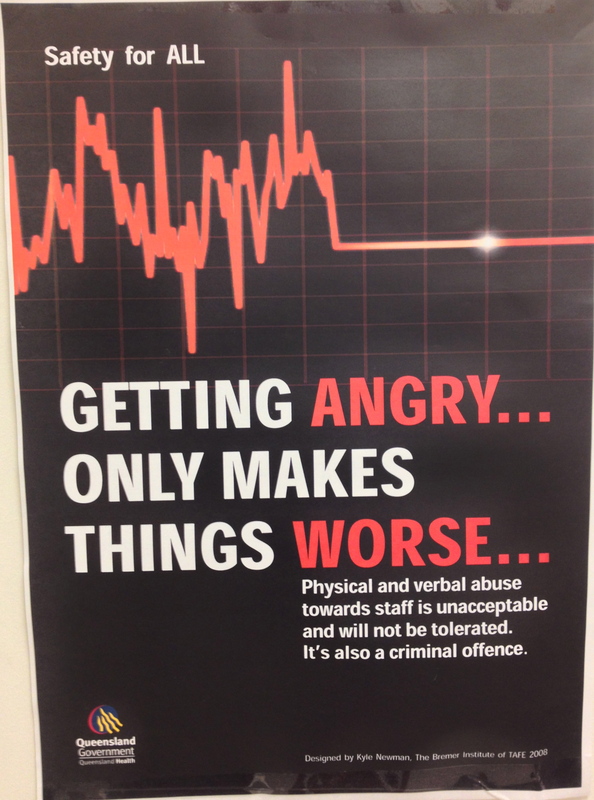 Of course, it’s not just posters on the wall that determine the quality and tone of the conversation. All health care workers should have an opportunity to reflect on their practice in a safe, structured way. As I’ve written about before (in “Nurturing the Nurturers“) clinical supervision (aka guided reflective practice) allows this to happen. There is an abundance of evidence that clinical supervision improves management of difficult encounters in health care settings – we should insist on it. Nevertheless, posters and signage can play an important part in setting clear expectations. Just as they’re doing in UK accident and emergency departments, let’s take a proactive approach to preventing and managing distress. Part of that strategy should be moving way from the authoritative, uncompromising and negative campaigns of the past, to one that demonstrates and models respect. This poster is my suggestion of the how we should set the parameters. Let’s not try to shut-down people from expressing distress. Instead, let’s invite patients and relatives to articulate their concerns before the emotions become so intense that they are difficult to contain. Put your hand up and talk to us. We don’t want you to feel distressed. If you are feeling upset, frustrated or unsure about what’s happening please don’t bottle-it-up: talk to us. 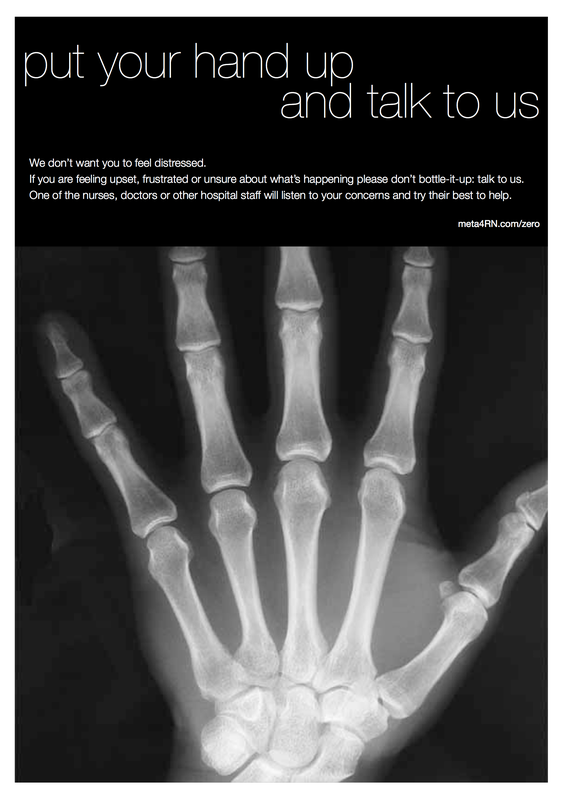 One of the nurses, doctors or other hospital staff will listen to your concerns and try their best to help. What would your poster say? Please feel free to share your ideas in the comments section below. This entry was posted in Blog and tagged clinical supervision, communication, dementia, emotional intelligence, innovation, nurturing, violence, zero tolerance on 7 December 2013 by Paul McNamara.